The “absorbed device user” meme, like someone following Google Maps on a smart phone so closely that they walk out into traffic, is becoming all too common. Not only can an interface that requires face time be a hazard to your health in traffic, it’s also not particularly useful to the visually impaired. Haptic interfaces can help the sighted and the visually impaired alike, but a smart phone really only has one haptic trick – vibration. But a Yale engineer has developed a 3D printed shape-shifting navigation tool that could be a haptics game changer. Dubbed the Animotus by inventor [Ad Spiers], the device is a hand-held cube split into two layers. The upper layer can swivel left or right and extend or retract, giving the user both tactile and visual clues as to which direction to walk and how far to the goal. For a field test of the device, [Ad] teamed up with a London theater group in an interactive production of the play “Flatland”, the bulk of which was staged in an old church in total darkness. As you can see in the night-vision video after the break, audience members wearing tracking devices were each given an Animotus to allow them to navigate through the interactive sets. The tracking data indicated users quickly adapted to navigation in the dark while using the Animotus, and some became so attached to their device that they were upset by the ending of the play, which involved its mock confiscation and destruction. Performing art applications aside, there’s plenty of potential for haptics with more than one degree of freedom. Imagine a Bluetooth interface to the aforementioned Google Maps, or an electronic seeing-eye dog that guides a user around obstacles using an Animotus and a camera. There’s still plenty of utility in traditional haptics, though, as this Hackaday Prize semi-finalist shows. There are 3.6 Million deafblind people in the world, and by far their greatest problem is one of communication. For his entry for the Hackaday Prize, our own miracle worker on hackaday.io is creating a system that enables haptic communication for a variety of devices. It’s called Tact-Tiles, and instead of creating a single device, [Anderson] is building an entire system that enables a multitude of communication devices for deafblind people. The basic unit of the Tact Tile system is a small, touch sensitive vibrating pad. These tiny PCBs can be fitted to just about anything, including a wired glove, or whatever haptic interface anyone can dream up. The core of the device is a small PCB that can control 32 of these vibrating pads, and communicates with a smartphone or computer over a Bluetooth connection. With a little bit of software, the Tact Tiles can be configured an any way imaginable, with mapping individual tiles to letters of the alphabet, mapping gestures to letters, or any combination in between. [Anderson] has a great video demoing the possibility of his device, you can check that out below. For his project entered in the Hackaday Prize, [Neil] is working on a navigation aid for the blind. He’s calling his device Pathfinder, and it’s designed to allow greater freedom of motion for the disabled. Pathfinder is a relatively simple device, with a cheap, off the shelf ultrasonic distance sensor, an ATMega, and a few passives. On its own, the ultrasonic distance sensor is only accurate to about 5%. By incorporating a temperature sensor, [Neil] was able to nail down the accuracy of his sensor to about 1%. Impressive! You can check out [Neil]’s quarterfinal entry video for the Pathfinder below. The most common way to put some sort of haptic feedback in an interface hasn’t changed much since the plug-in rumble pack for the Nintendo 64 controller – just put a pager motor in there and set it spinning when the user needs to feel something. This method takes a relatively long time to spin up, and even the very cool Steam controller with voice coiled directional pads can’t ‘stick’, or stay high or low to notify the user of something. [Tim]’s day job is working with very fancy piezoelectric actuators, and when an opportunity came up to visit the Haptics symposium, he jumped at the chance to turn these actuators into some sort of interface. He ended up creating two devices: a two-piezo cellphone-sized device, and a mouse with a left click button that raises and lowers in response to the color of the mousepad. 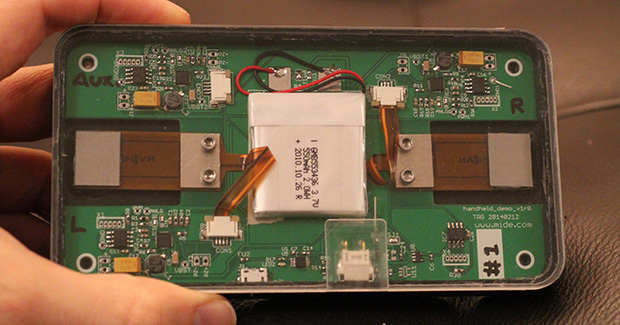 The cellphone device contains two piezo actuators with a 10 gram weight epoxied on. A small microcontroller and piezo driver give this pseudo phone the smoothest vibrations functions you can imagine. The much more innovative color-sensing mouse has a single actuator glued to the left button, and a photosensor in the base. When the mouse rolls over a dark square on a piece of paper, the button raises. Rolling over a lighter area, the button lowers. It’s all very, very cool tech and something we’ll probably see from Apple, Microsoft, or Sony in a few years. Videos of both devices below. While I was at Heatsync Labs in Mesa Arizona, [Nate] mentioned that he was really proud of helping someone build a robotic hand. I have tracked down that project because it looked pretty cool. [Macguyver603] built this robotic hand that is controlled by a glove with flex sensors. He was originally going to 3d print the structure for the hand but the availability of the laser cutter allowed him to create something a that would be a little more structurally sound. Haptic feedback is supplied by vibrating pager motors that are triggered by sensors in the tips of the robotic hand’s fingers. The total cost of the project was roughly $240, and there’s unfortunately no video. It did, however, earn him second place at the state fair!